My second collaboration with fine art photographer Emma Pilkington was inspired by the chateaus and landscapes in the south of France, but shot on location in the Peak District. 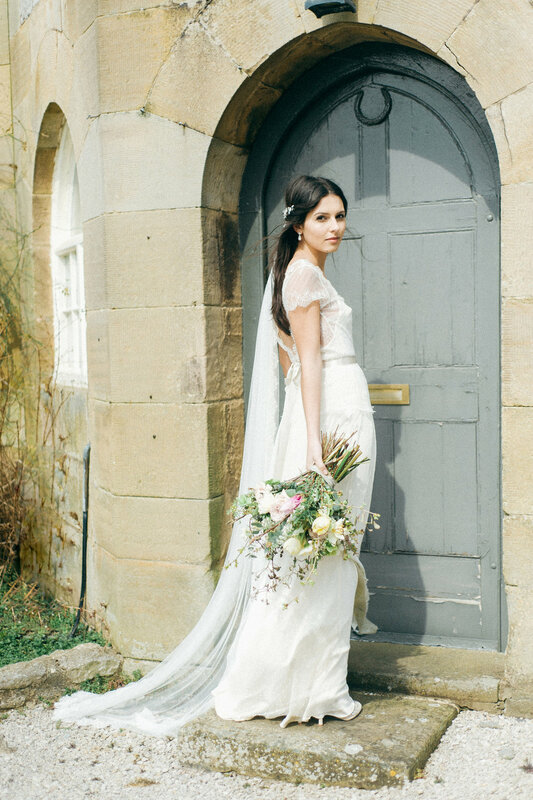 We chose Hassop Hall for its chateau-style stone walls in muted buff tones – the perfect backdrop for our soft and dreamy editorial. Emma and I decided on four of my dresses for this shoot: 2 bias-cut silk gowns and 2 lace ones. The silk gowns – Honeysuckle and Delphinium – are both made from coloured silk satins, which toned beautifully with our colour palette. 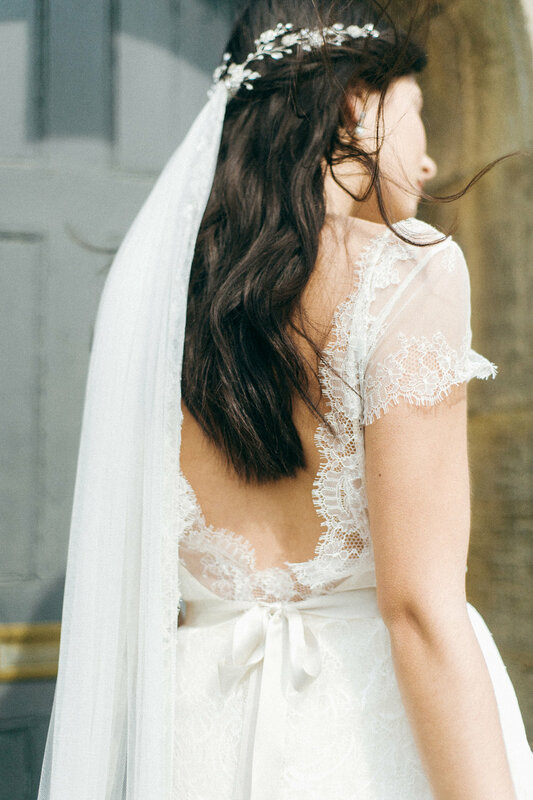 Honeysuckle’s silk is a warm oyster, with antique lace trim in a complementary shade draped over the shoulders and down the back. 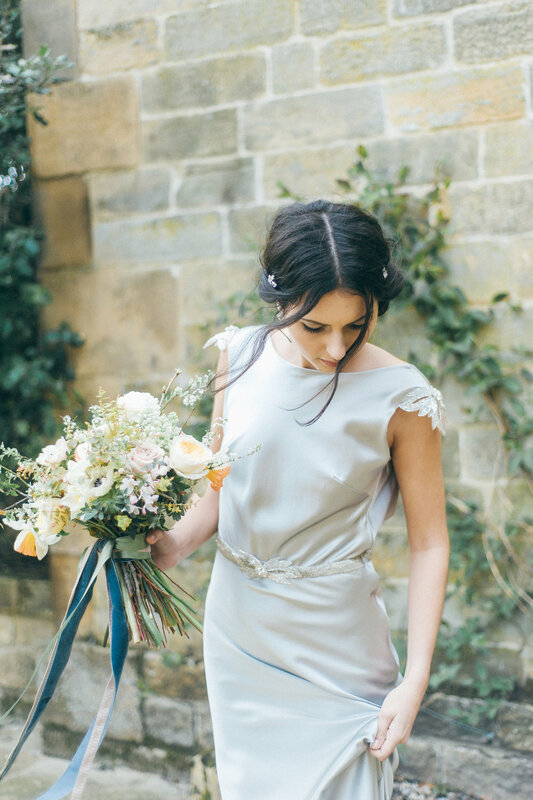 Delphinium’s molten-metal silver silk is paired with Debbie Carlisle’s sparkles at the shoulders and waist, and usually creates a more dramatic look, but the softness of this shoot shows it off in a more gentle and effortless style. Both drape beautifully when worn, and the sheen and colours of the silk vary as they catch the light. I also chose to pair my Lilac short lace dress (worn over a silk satin slip), with my Peony polka dot tulle gathered skirt. These pieces together create a whimsical, romantic and very feminine look. 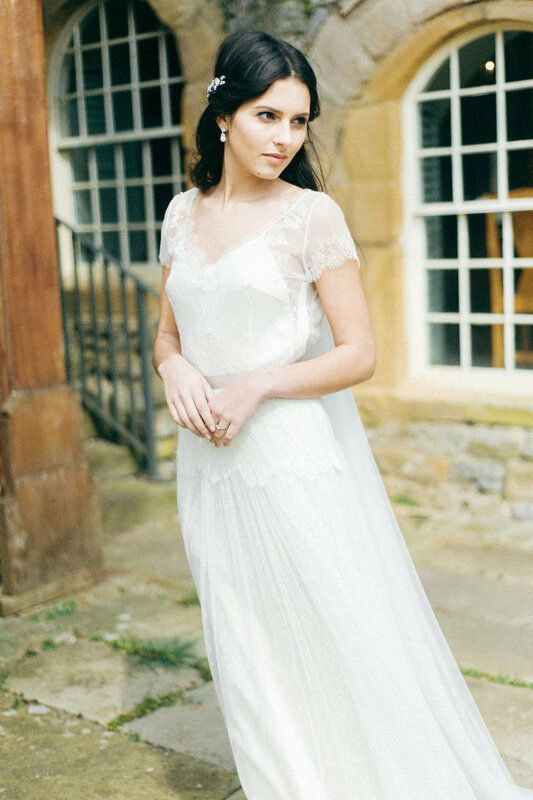 My Anemone French lace gown completed the looks on the day – a simple silhouette created in a soft and delicate lace, with a bold yet subtle all-over floral print. Debbie Carlisle paired each dress with delicate hair vines from her Secret Garden and Enchanted collections, and hair and make-up artist Sarah Morten created four different effortless and naturally styled looks for our gorgeous model Sophia. 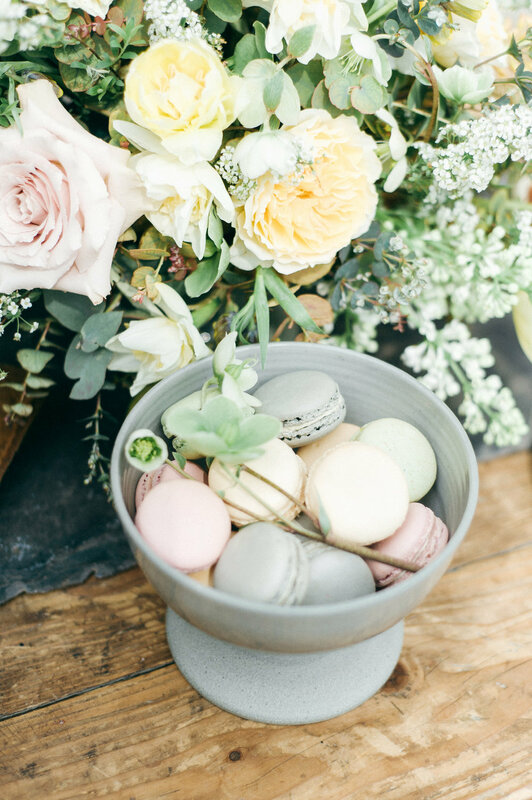 Stylist Nina Marika created a stunning rustic tablescape for us, with florals by Swallows and Damsons at its centre, alongside a semi-naked cake and pastel toned macarons by Joni, and hand-lettered stationary by calligrapher Claire Gould.